I generously covered them in a mixture of 1 cup of panko breadcrumbs, 1/2 cup of parmesan cheese, 2 tablespoons of chopped parsley and 3 tablespoons of melted butter. This mixture was gently patted down. The fillets were baked for 15-20 minutes in a moderately oven by which time the panko crumb mixture was lightly browned and the fish was done. Alongside the fish I served a spicy dressing made by stirring a large dollop of Japanese Kewpie Mayonaise into a mashed avocado and adding the juice of a lime. To add some heat I sprinkled some nanami togarashi on top . These are little flakes of assorted chili peppers . This mixture was then lightly sprinkled over the snapper ( You may well have some over) Bake as in the previous recipe. We celebrated the beginning of the festive season by a tasting of four of Mike’s Organic Beers the other night when we had a few friends around for dinner (One of whom is called Mike). OMPA Pale Ale. This was the second choice of all of us. We found the beer had a nice citrus nose, was a refreshing taste and was good drinking. Highly recommended. Without Warning India Red Ale. An enjoyable ale, but most of it found it to be a stronger flavour than we are used to drink. CMS Chocolate Milk Stout. The favourite of all of us. The stout was sweet, and did have a genuine chocolate taste. It was smooth and we were looking for more at the end of the tasting. All in all, a great way to start the evening. And a good choice as Mike's Beers are organic and are NZ made by a family owned company of beer brewers from Taranaki. This week I was given a bottle of Two Black Dogs extra virgin olive oil to try. I love the back story. Graham and Nicky live in Mangawhai in Northland, New Zealand. Having bought a property on which there was a grove of olive trees they decided to jump in gumboots and all to produce this lovely grassy green extra virgin olive oil. Their first olives were harvested in May 2015 and their Ascolano olives were used to produce a small run of extra virgin olive oil which has been certified by Olives New Zealand as Extra Virgin Olive oil. Their two black labs have the best kind of dog's life running amongst the trees, sniffing around , sampling the odd olive and absorbing the sun after a swim. The olive oil is named after them and they feature on the label. 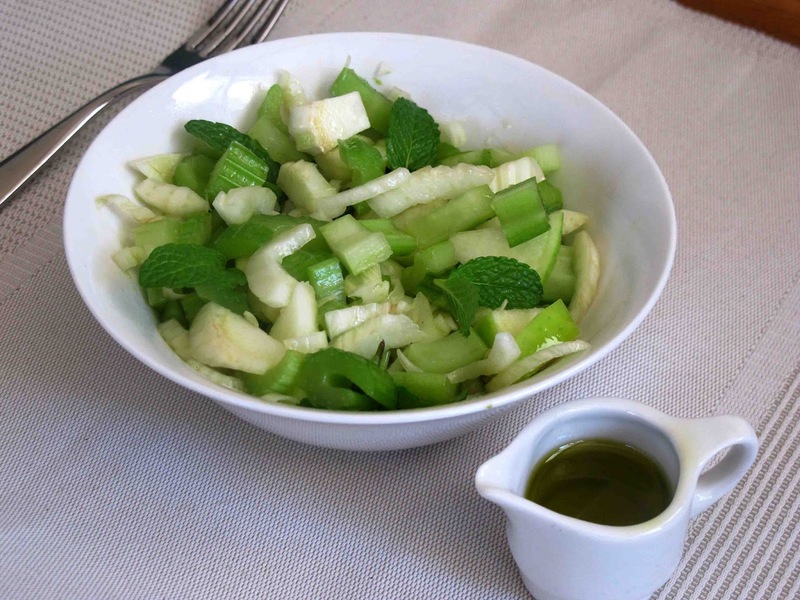 I first tasted a salad made with just three ingredients: celery, fennel and apples at my sister in law Janet's house in Sydney recently and it has become a firm favourite at our home. To make it I sliced a couple of celery stalks, two fennel bulbs and two Granny Smith apples ( unpeeled) and put these into a salad bowl. I dressed the salad with 3 tablespoons of Two Black Dogs extra virgin olive oil , the juice of 1/2 lemon (or you could use 1 lime) and some freshly ground rock salt. My special touch was to leave the dressing to soak in for an hour or so. Then I tucked in a few freshly picked mint leaves and provided a tiny jug of Two Black Dogs extra virgin olive oil alongside to dribble over it as this really boosted the flavour. So what should come first when you have a slice of ciabatta, an avocado and some Two Black Dogs extra virgin olive .It's a debatable point. 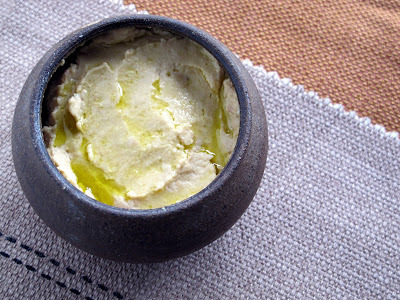 My son Nick uses olive oil like butter (he likes the way it soaks in and flavours the bread) and then adds the topping. Preferring to avoid soggy bread I do it the other way round. 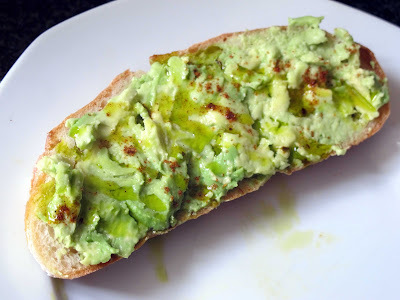 I mush up some avocado, spread it liberally on the bread and add a generous drizzle of Two Black Dogs extra virgin olive oil which pools and glistens on top. Then I grind some rock salt on top and a sprinkle of Mexican spices or dukkah. Yum!The perfect breakfast. You can of course buy a packet of pita bread for this recipe but home made is nicer. For the topping I picked a bunch of herbs from the garden : rosemary, thyme and oreganum, chopped them finely and smashed a peeled clove of garlic with some rock salt. I stirred this mixture into three tablespoons of Two Black Dogs extra virgin olive oil. Then brushed it liberally onto two pita breads. They were baked in the oven) at 200 degrees C for about 10-15 minutes until the bread had crisped up. 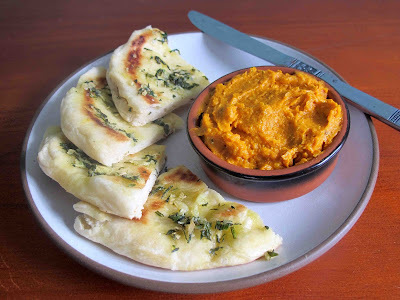 We had this for lunch with some kumara flavoured hummous, delicious! At the Takapuna market on Sunday I found some canned hearts of palm. I'd never used them before but thought I'd try them in a salad. And the verdict ? Very tasty and would make again. I simply drained the liquid from a 400 gm can of hearts of palm. These hearts of palm look like little fat sticks but are quite tender).I sliced them quite thickly and put them into a salad bowl. Then added two chopped tomatoes, the finely sliced whites of 2 spring onions and plenty of flat leaved parsley. 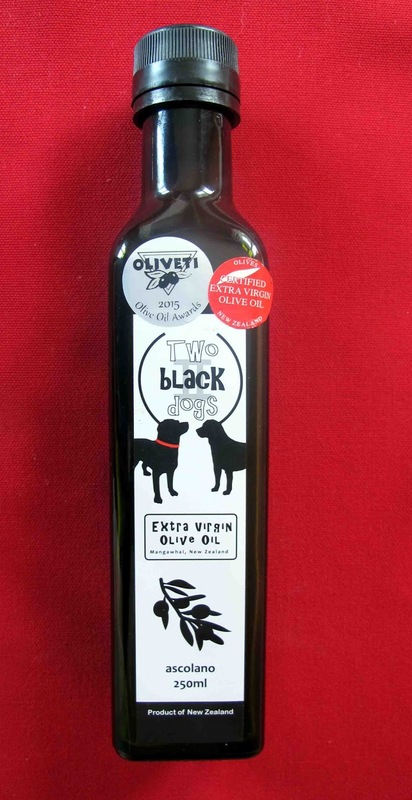 The dressing was made with 2-3 tablespoons of Two Black Dogs extra virgin olive oil and the juice of !/2 lemon. The following evening we had this salad again. This time I added a chopped up avocado and arranged the salad on a bed of mesclun leaves. Some feta crumbled over the top completed the dish. And here are some a pictures of the the handsome and bouncy black Labrador George, and his bosom pal little Millie! 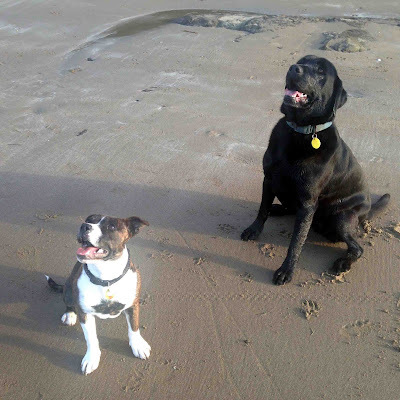 These two are the much loved pets of my daughter Rachel her partner and our three granddaughters. No olive trees for them but a nearby beach to cavort on ! 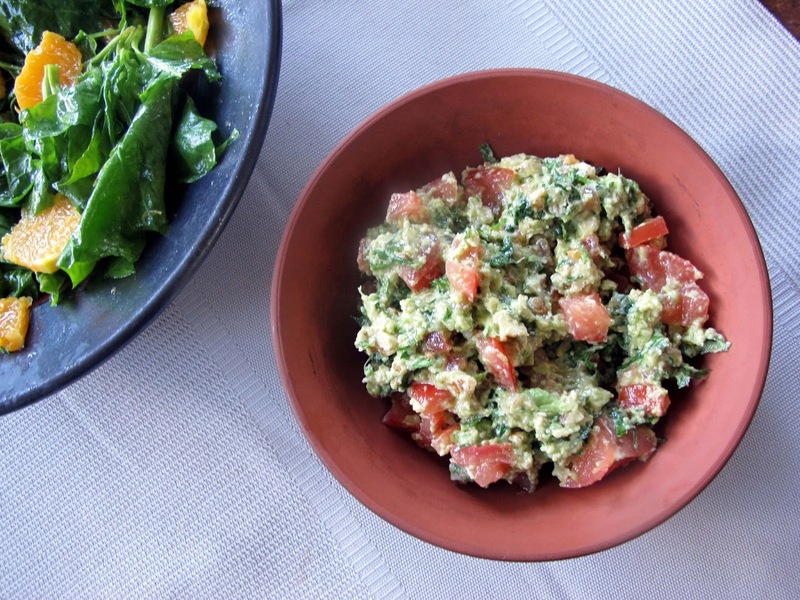 Quinoa Tabouleh with a smoked paprika and mustard dressing. 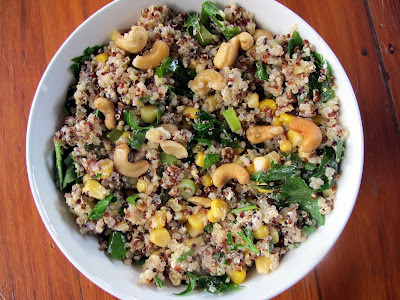 This is the tastiest quinoa salad I have made this year, inspired by a recipe in Yvette Van Boven's 'Home Made ' recipe book. It made good use of some of our abundant crop of parsley and the last of our rocket. What intrigued me about this recipe was the combination of smoked paprika and mustard in the dressing giving a slightly smoky and pungent flavour. Thanks Nick for being the taste tester. Sort through the Quinoa as sometimes small stones are present and it pays to remove these little toothbreakers. Then rinse under running water, In pot , put a cup of Quinoa or Super Grain Mix with 2 cups of watr. Cover and bring to the boil. Reduce heat and simmer until all the liquid is absorbed, about 15 minutes. Leave to cool until lukewarm.Add the other ingrdeints and stir in the dressing. Season with salt and freshly ground black pepper to taste. Shortly after La Boca Loca opened we enjoyed a lovely meal there. Before that our experience of “Mexican” food had been limited to the hearty pots of chili con carne we used to cook in our student days, and tortilla chips smothered in melted cheese served with sour cream and guacamole. So it was exciting to discover so many new dishes and to taste those earthy, smoky and spicy Mexican flavours. Afterwards I was invited into the restaurant kitchen to see how corn tortillas were made by hand on a tiny press so that each one ordered in the restaurant would be perfectly fresh. Lucas Putnam grew up in a part of America with a large Mexican American population where Mexican food was readily available. But when he landed a job at Weta Digital to work on the Lord of the Rings trilogy and came to New Zealand in 2001 he was surprised to discover that the fresh and tasty kind of Mexican food he loved was not to be found in Wellington. So he persuaded friends who travelled to Mexico to bring back the essentials he needed and cooked it himself. Before long he was hosting a Mexican dinner party every weekend. They became so popular that he was eventually persuaded to establish a Mexican restaurant with partner Marianne. Their aim was to bring the spirit of Mexico to the heart of Miramar by combining traditional Mexican ingredients with fresh and locally available ingredients. La Boca Loca opened its doors in 2011. Four years later when they had hand-pressed 200,000 corn tortillas, made almost 70,000 burritos, 45,000 litres of salsa and poured 60,000 margaritas, the time felt right to write the cookbook which customers and friends had been asking for. In went the most popular dishes and cocktails from their restaurant menu as well as some personal favourites. Interesting chapters on the history of Mexican cuisine, pantry essentials and basic techniques such as handling chillies, how to prepare masa, press your own tortillas and making fresh and cooked salsas are also included. If you are planning to try your hand at cooking Mexican food it is essential to know your chillies as these are widely used in Mexican cooking. I know how important this is from having once burnt my mouth horribly by biting into a fiery one grown by a Mexican friend. So the chapter on chillies, what they look like, how to use them and how each rates on the heat scale from mild to exceedingly hot is a must read. But fear not, much Mexican food is not very hot at all or only as fiery as you want it to be and the heat can easily be adjusted to your taste. Nothing is more annoying when you are keen to try a recipe from a different culture than not being able to find the ingredients. At La Boca Loca, they use fresh and local ingredients wherever possible but some that are unavailable here have to be imported. You can purchase or mail order these directly from the restaurant. and they are not expensive. Fresh corn tortillas: These were so easy to make using only three ingredients (masa harina flour, water and salt). A fun way to keep the grandchildren entertained in the kitchen! Breakfast burritos: There are several variations in this book but we love the simplest one filled with scrambled eggs, crumbled feta or grated cheddar, chopped tomatoes and avocado with a little hot sauce to taste. Salsas are an essential part of a Mexican meal. The one I make most often is a mixture of finely diced onion, diced tomatoes and chopped fresh coriander, sharpened with lime or lemon juice and seasoned with a pinch of flaky salt. Adding chillies is optional. Lucas encourages experimenting with whatever fresh fruit is in season. In autumn they use feijoa and in winter tamarillo. 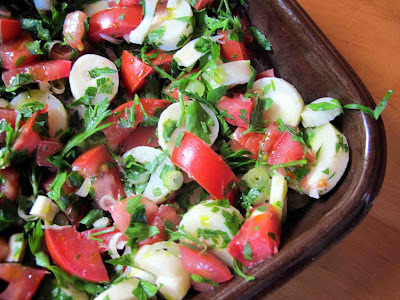 Ceviche de Pescado: This marinated raw fish salad tastes fresh and light. Far superior ras an appetiser to that old sixties favourite the prawn cocktail! Black Bean and Corn salad is a healthy medley to eat with corn chips or tostadas. I find this a very useful recipe to make when there are vegetarians in the house. Mexicans love to party. 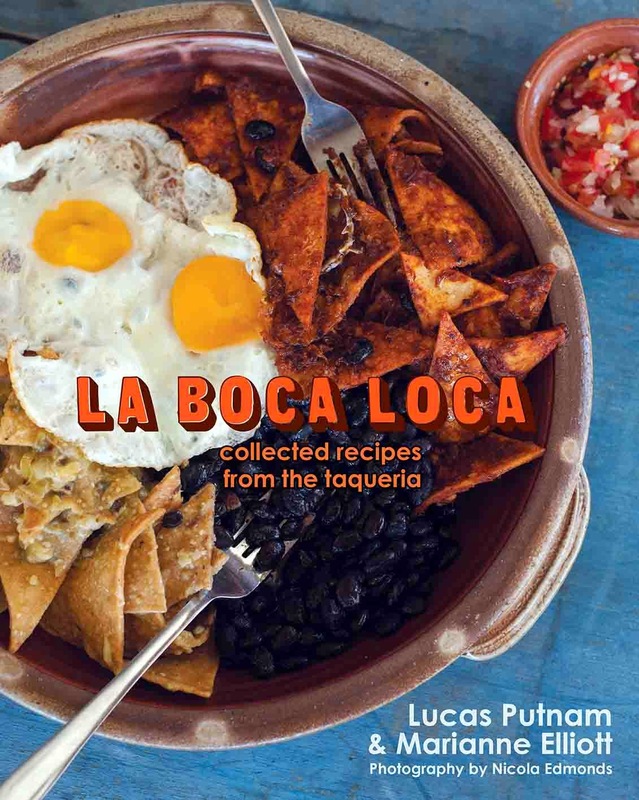 And La Boca Loca is famous for its cocktails created by its various bartenders whose legacy lives on in a bunch of tempting recipes for margaritas, sangria, mojitos, and fresh fruit juices. 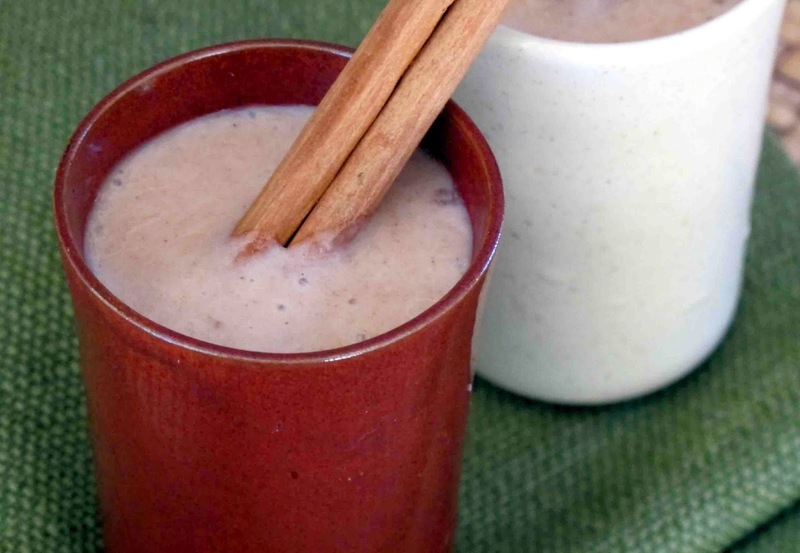 When we have a Mexican feast or fiesta we’ll have ve to try some of these as well! 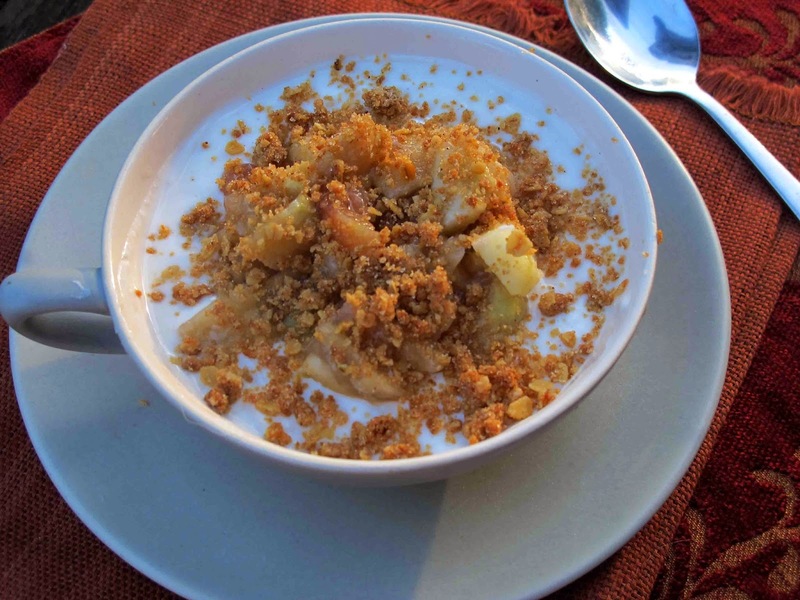 A jar of this spicy crumble mixture will keep for at least a week in the fridge . I sprinkle it on warm stewed apples and feijoas for an almost instant winter dessert or over sliced mango and Greek yoghurt. Delicious! Grate the butter or chop into small pieces and add in. 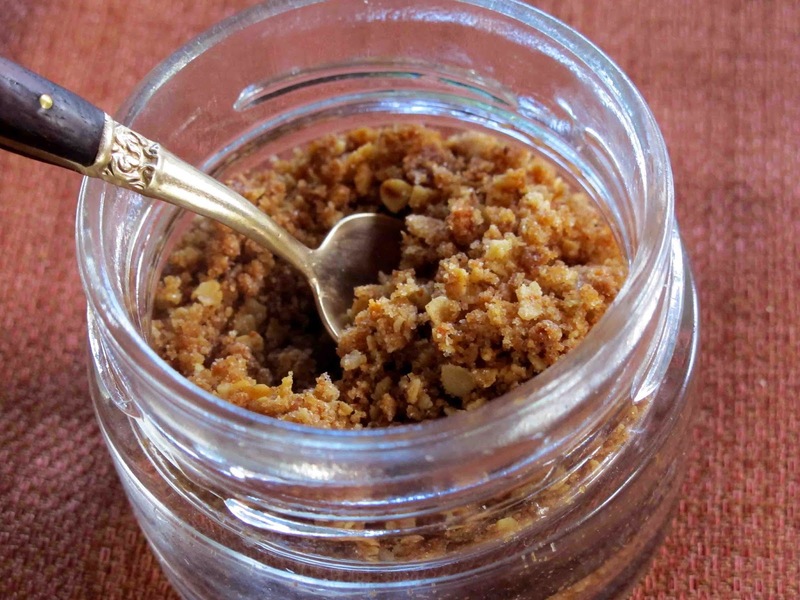 Whizz briefly until the mixture looks like breadcrumbs.Add the rolled oats and whizz for a few more seconds to combine. Put the masa harina, spices, and sugar into a bowl and cut or rub in the butter until crumbly. Mix in the rolled oats. Spread the crumble on a baking paper lined tray in one layer and bake at 180 degrees C for about 15-20 minutes until it is golden brown. Watch carefully, you don't want it to burn. Leave to cool down before storing in the fridge in a lidded jar. 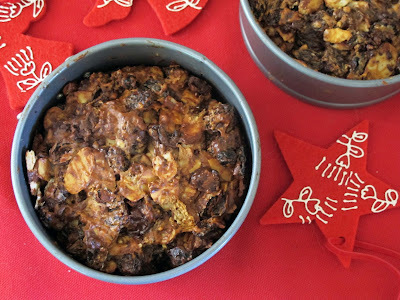 This is real comfort food and lighter than porridge made with oats. 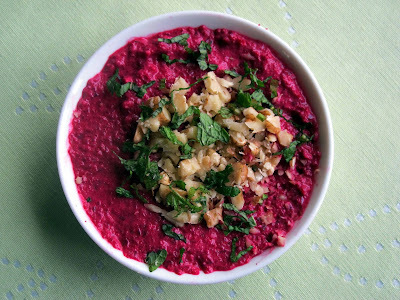 If you just need something warm and nutritious to fill your tummy and to ward of the winter chills try it! or sprinkle with a mixture of castor sugar, cinnamon and chopped walnuts. Sometimes you just want the kind of breakfast you can whip up very quickly and sip while reading the newspaper , checking your emails or better still just sitting quietly and relaxing for a few minutes before the day gets busy. I always keep some chopped up bananas in my freezer to make one ingredient banana icecream and recently discovered that I could also use them to make this nutritious smoothie. Put into in a blender or food processor with the still frozen chopped banana and the yoghurt. Put into a tall glass and sip, or scoop out with a teaspoon. Gluten Free Little Masa Harina pancakes. When I was cooking up pancakes for brunch there was no way I wanted a gluten free guest to miss out so I had to improvise. These little gluten free pancakes made with masa harina were the result. They had quite a distinctive flavour but were nice in their own way. At their best when piping hot, they lost their charms when cold. Crack the egg and drop in. Add 1 cup of milk and whisk all together thoroughly until the batter is perfectly smooth. Leave to stand for 1/2 hour. Whisk in another 1/4 cup of milk or enough to make the batter slightly thicker than pouring cream. Heat the fry pan then a little oil, just enough to grease the pan. For each little pancake use an ice cream scoop as a measure. When bubbles appear and the pancake has browned on the bottom flip it over to cook the other side. Don't rush the process , let them get a little crispy. Serve while hot dusted very lightly with icing sugar. Pass maple syrup to pour over. 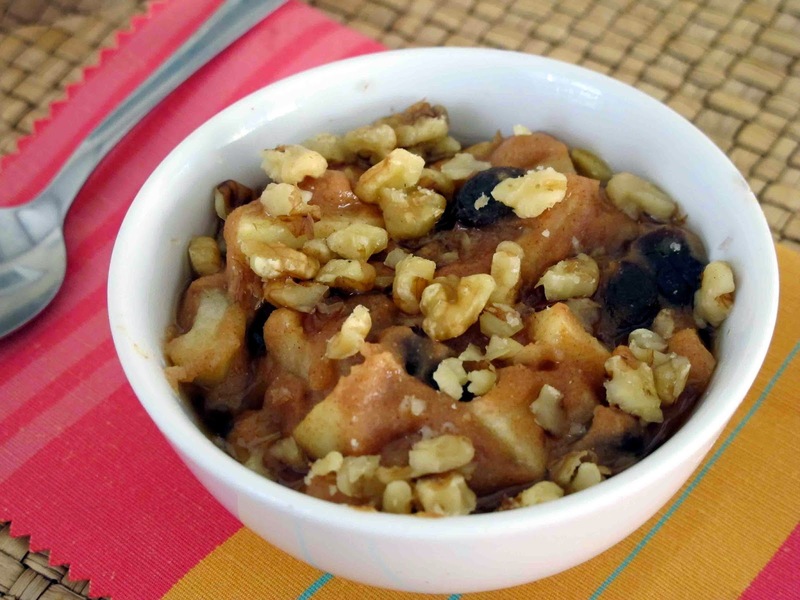 Or some stewed apples to which a little lemon juice and cinnamon has been added/. I like to serve these mini corn breads either as a party food or for a light lunch. 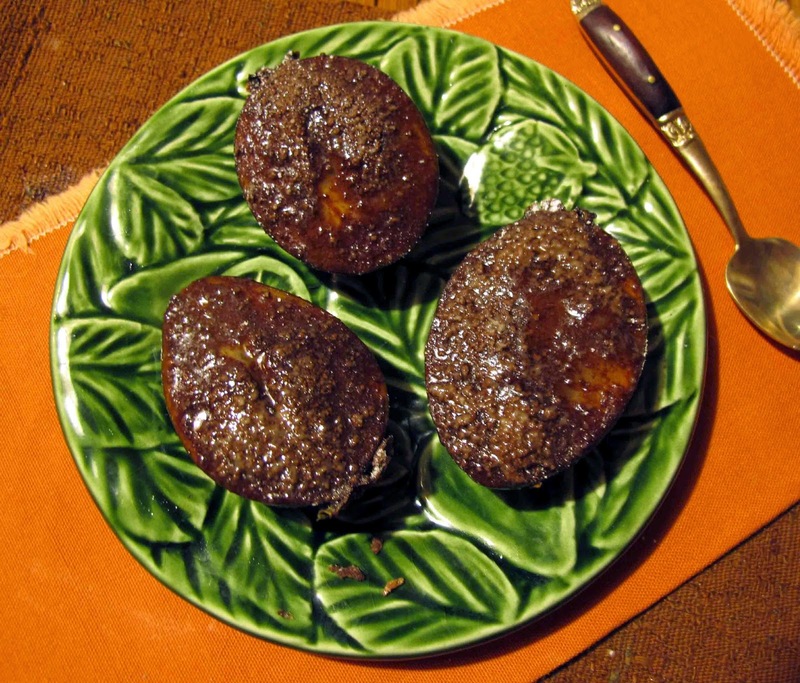 They are based on Dame Alison Holst's evergreen recipe for champion cheese muffins but baked in little silicone loaf pans. Part of the flour has been replaced by masa harina which intensifies the corn flavour. These little loaves ( unfilled) also freeze really well and can be quickly defrosted and reheated in the microwave . optional: some chopped sundried tomatoes, olives, parsley and coriander. Put all the dry ingredients and grated cheese into a large mixing bowl and mix together lightly with fingertips to combine. In a small bowl whisk the egg and milk together. Pour this liquid into the dry ingredients , then fold together briefly. Do not over mix. Bake for about 15 minutes unto they have browned and spring back when lightly touched. When they have cooled to room temperature fill with cream cheese and slices of smoked salmon. 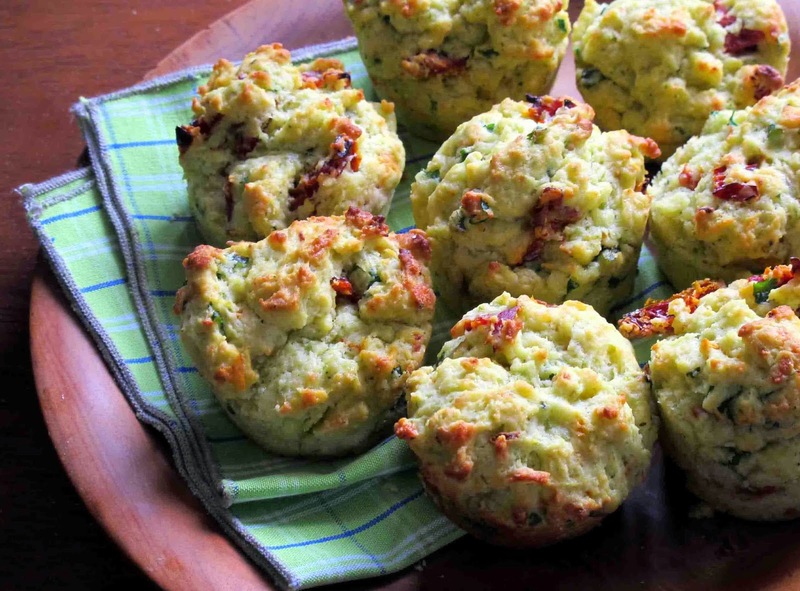 I also use the same batter to make mini cheese muffins to which I add chopped sundried tomatoes, coriander and parsley. 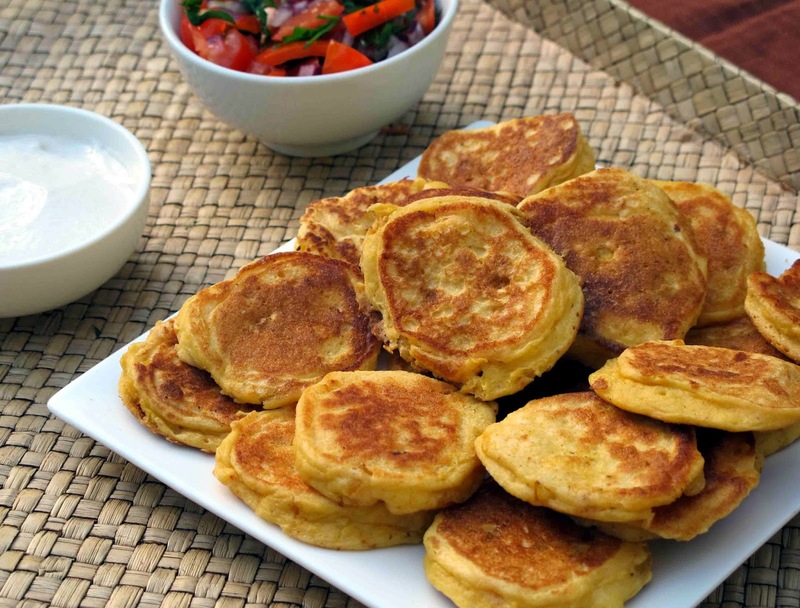 While these little corn fritters are gluten free those who are not also enjoyed them . I only had moments to photograph them before they were all gone. So this is one of those really good recipes where one kind of fritter fits all. Fry until they are golden brown, then flip over and fry the other side.Don't rush the frying as you don't want uncooked centres . My youngest granddaughter Emily and I are busy in the kitchen making little Chinese sponges together. I’m teaching her how to crack eggs and to whisk them with sugar until they are creamy. Then we measure and sift the dry ingredients, fold them in and add one tablespoon of oil. Granny Shirley “Mama Chan, whose recipe it is, assures us this little bit of oil will make all the difference. Spooning the batter into little muffin pans turns out to be a messy job for a beginner but after some mopping up they are into the oven. They come out perfectly, tender inside and crusty out. And what is especially good about these is that they are dairy free, as Emily is. 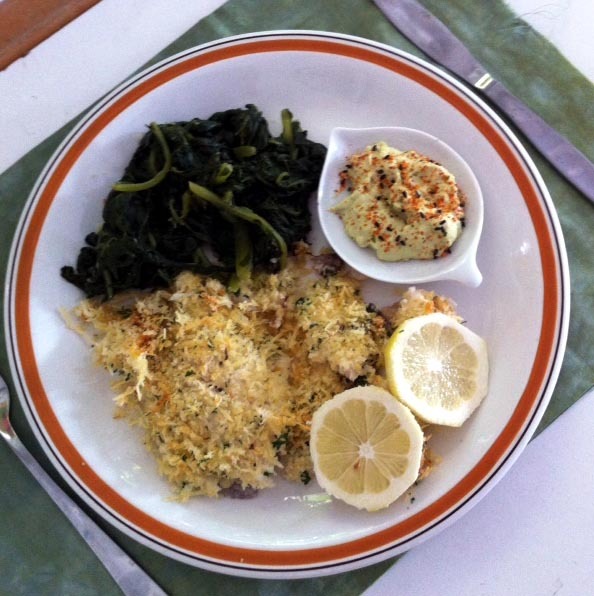 This was the first recipe we cooked from Love & Food at Gran’s Table by Natalie Oldfield. Soon to be followed by Australian damper, a bacon and egg pie and rhubarb crumble. All tried and true recipes that are bound to become family favourites and which our granddaughter will soon be able to cook for us at family get togethers. But Love & Food at Gran’s Table is much more than a book jam-packed with treasured family recipes. It’s full of stories about 60 special grans from around the world .They and their children and grandchildren reminisce fondly about good food shared around the family table. 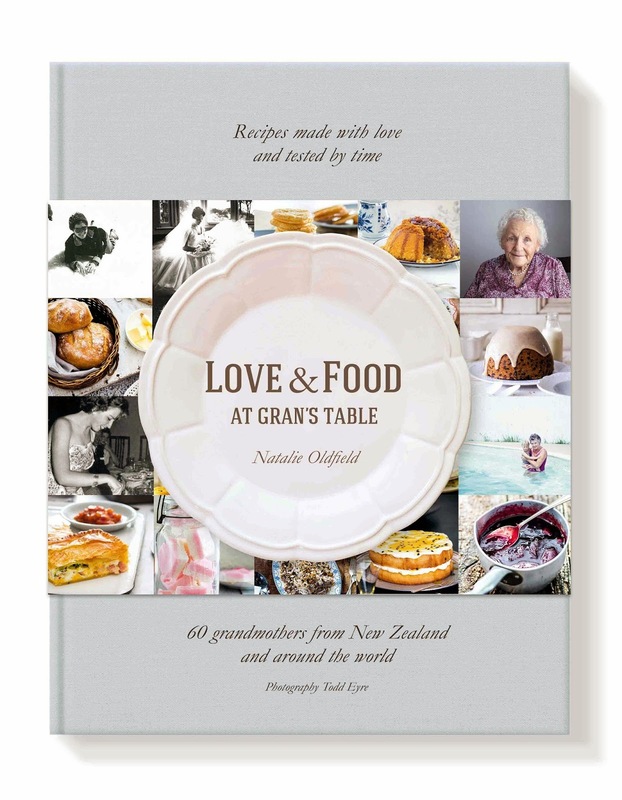 Auckland born Natalie Oldfield wrote this book as a tribute to her two grandmothers Dulcie May Booker and Nana Rita Burrell and the love of cooking they inspired in her. Many of the grans had to pick up cooking skills for themselves, or learnt just by watching their mums with no written recipes to guide them .They cooked from scratch with basic ingredients but still managed to feed their families generously and well. 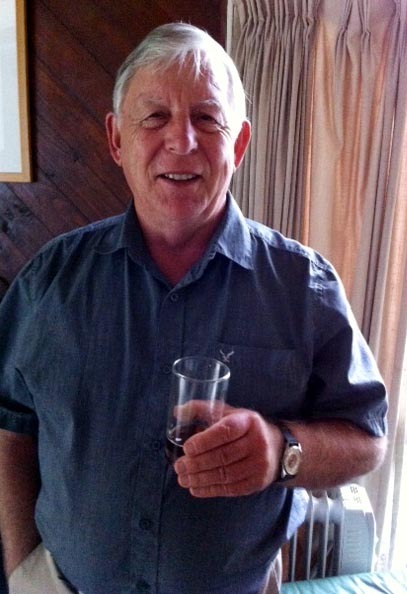 I have been married to John Blackwell for 52 years, and he has seldom cooked a meal in all that time! Jenny Ngau is one of the few grans ( 5 children and 13 grandchildren) who is married to a husband who likes to cook, but she does divulge that it’s always best done by one OR the other. Baking was especially popular with these grans so there are plenty of biscuits, cakes, pies and desserts to tempt you into the kitchen. 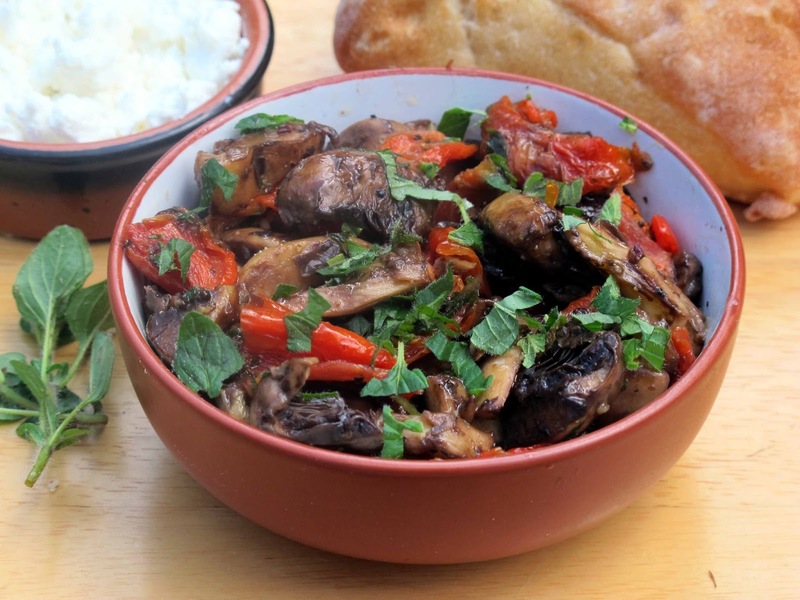 As well as savoury dishes such as smoked ribs, meatballs and homemade preserves and chutneys. Many were keen to pass on their culture through food to the next generation so there are traditional recipes from different countries including Croatia, Scotland, the Lebanon, Samoa, and Japan. 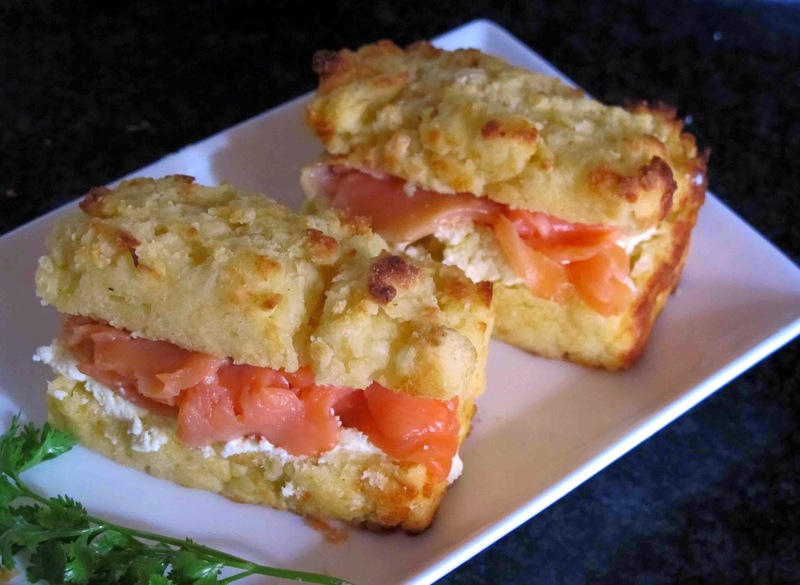 The Swedish Gravad Lax (dill –cured salmon), French potato pie, Japanese sesame raw fish and Scottish black bun all look delicious and are not difficult. It’s not often that you find Dutch recipes in New Zealand cookbooks so I was especially delighted to find two here. The bitterballen are tiny deep-fried meatballs with a crispy coating. This cocktail snack is a great favourite in Holland. The second recipe is for poffertjes. 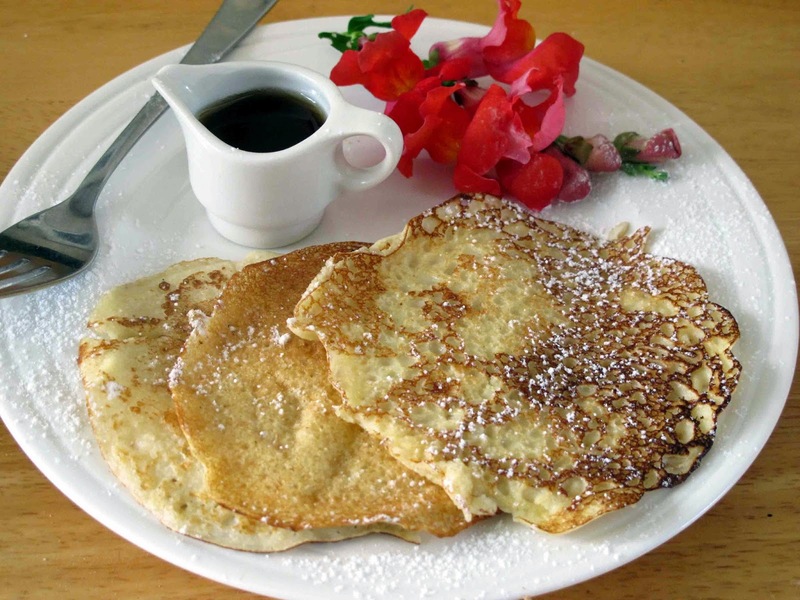 These tiny puffy pancakes are much loved by Dutch children. They are usually sweet, served liberally dusted with icing sugar and a dab of butter so the savoury ones in this cookbook are a healthy alternative. For many readers Love & Food at Gran’s Table will bring back fond memories of their own special grans. We had one in our family, my mother-in -law who each Sunday evening invited her children and grandchildren over. Looking back I think we rather took the effort involved in cooking all those roast dinners for granted. Wasn’t that just what grandmothers were supposed to do? It’s great that this piece of social history has been published and a lovely way to honour these 60 grans from around the world. They deserve their spot in the limelight. Through their hard work and unselfish generosity they were often the glue that held families together. The many cultural festivals we have in Auckland each year are a very pleasurable way to pass the time, and an excellent opportunity to have a taste of the crafts, music, dance and street food from the many different communities who have settled in New Zealand. Today, at the 'Cloud' was Japan Day and here I discovered Kyuri asa-zuke for the first time. Japanese pickles are different to ours and are not built to last. 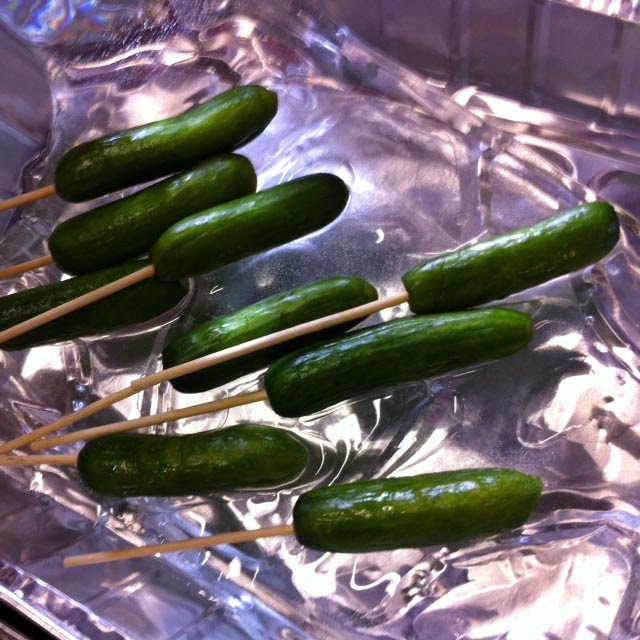 They are usually sliced and marinated in a variety of pickling liquids and should be be eaten within a few days. They can be served as a garnish, a salad or at the end of a meal. Less commonly they are , like these kyuri asa-zuke , served whole, at a festival. Although they looked rather alarmingly like green sausages I suspect they would be delicious so am keen to try to hunt down some thin skinned Japanese cucumbers and the recipe. I would have tried them, but had already had my fill of pork dumplings and a scoop of gourmet Kohu Rd macha (green tea) ice cream. There's such a profusion of basil growing in the garden at present that I was persuaded to make some pesto and used some of it to make these very tasty savoury cheese muffins with a Mediterranean flavour. 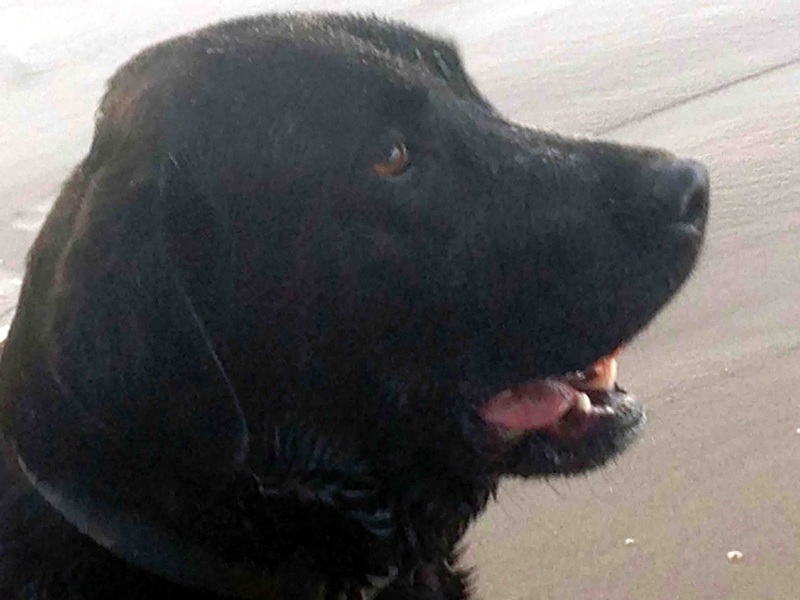 So good to come home to after a walk with Abby the mischievous Lab along the beach. Sift the flour into a bowl. Add the cheese. Bake at 200C for 12 minutes. Leave to stand until until they have cooled to lukewarm before turning out. No need to butter but do if you must. 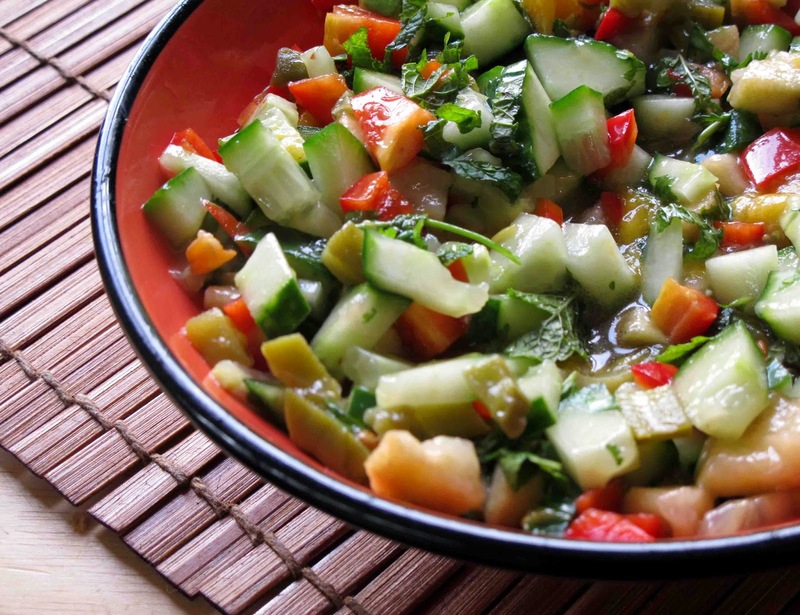 It's a colourful mix of chopped feijoas, tender cactus nopalitos from La Costena, red pepper, cucumber , mango, mint and coriander. I also added a minced chillie for some heat, a tablespoon of fruity olive oil , and a sprinkling of Tio Pablo's citrus chilli salt. 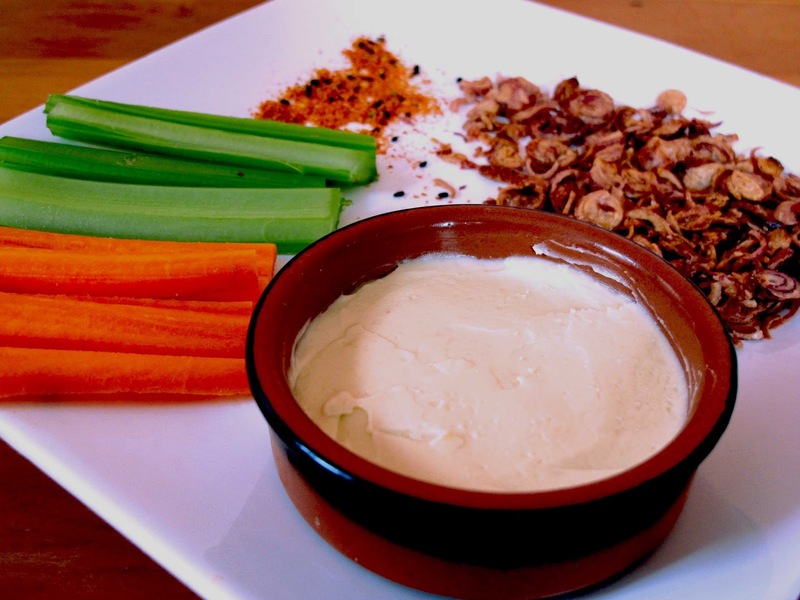 So healthy and so good to have for a quick lunch. But do remember to rinse the slime from the tender cactus Nopalitos before using! Halved, flesh scooped out with a spoon and replaced. Covered with a lavish sprinkle of grated chocolate , castor sugar and cinnamon and baked until piping hot.Served with Greek yoghurt.